From the early part of the 19th century Maybole always had a silver or brass band to entertain the local people on a summer evening in the Town Green or on New Year's morning when the bandsmen paraded the streets to the sounds of "A guid New Year tae ane and a'." There was a brass band, known firstly as the Maybole Carrick Band, then the Carrick Instrumental Band and finally the Maybole Burgh Band and it was in existence, with short lapses through lack of bandsmen, for well over a hundred years. 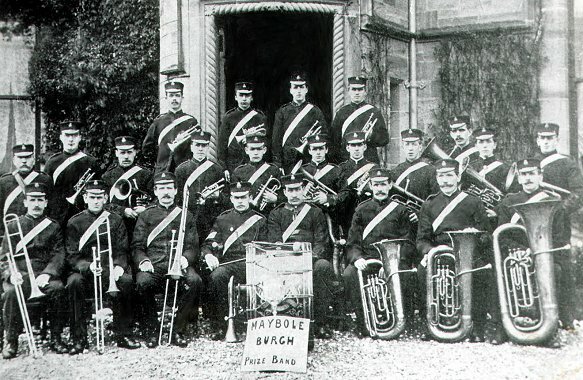 In 1867 the band instruments were taken from the local bandsmen, because they would not attend practices, and given to the Volunteers who formed a band among its members, and although for a time it was factually a military band it was always considered the Maybole band. 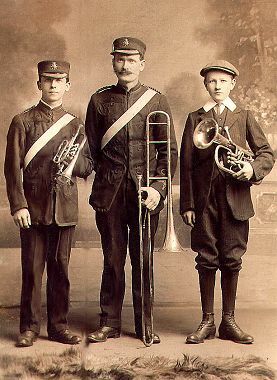 About the turn of the century the instruments were returned to the Council and the Maybole Burgh Band came into existence before the first World War. 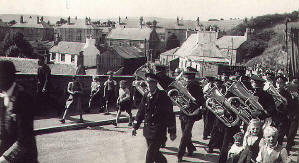 It won many competitions under the leadership of Mr. Shaw, the Bandmaster, and played in the town and district for many years until, again through lack of young people attending practices, in the 1950s the Council took over the instruments and stored them away and the town was left without a band. It was hoped some townsmen interested in band music would come forward and another band be formed but this was not to be and, as the instruments were deteriorating in storage, the council sold them. 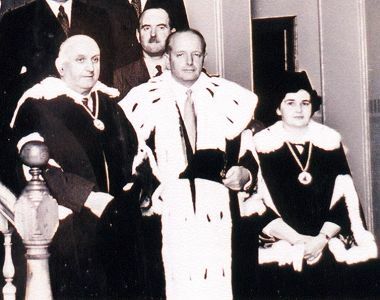 By coincidence the council purchased scarlet and ermine robes for the Provost and Bailies about the time the instruments were sold and it was the ribald belief of many ratepayers that the council had robbed the band to robe their civic heads and that it was the sale price of the big drum which went to buy the Provost's cocked hat. Whatever be fact or fiction, the fact is Maybole has no band nowadays while it is no fiction that the Provost and Bailies have scarlet robes and cocked hats. (From Maybole, Carrick's Capital. Facts, Fiction & Folks by James T. Gray,) Photos on this page contributed by Bill McCubbin. John Hempkin, John Hempkin and Matt Hempkin. Circa 1922. All members of the Hempkin family who were very active in the music scene in the town right through till the 1950's (those in the picture and their descendants) . 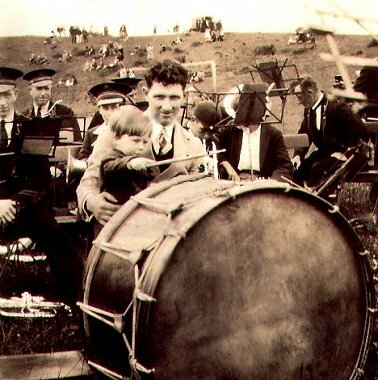 The very young drummer (left) is John Hempkin with the Burgh Band in the background. Note the goalposts and the sloping ground to the rear. This is the sheep park. Circa 1932. 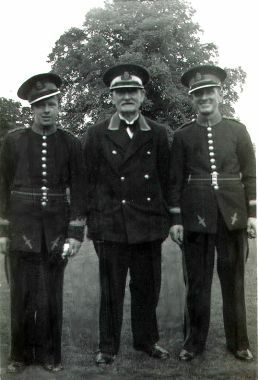 Mr. W. Shaw (right) was the professional conductor of the Maybole Burgh Prize Band. 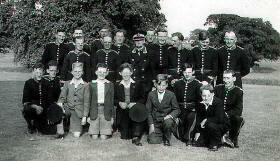 Burgh Band 1948. A. McColm, J. Colquhoun, A. Dixon, J. McEwan, W. McColm, K. Murray, ? ,J. Harris, R .McColm, J. Roy, R. Colquhoun, A .Steel, A. Gardiner, J. Campbell, M. McAlpine, J. Hempkin, S. Boden. 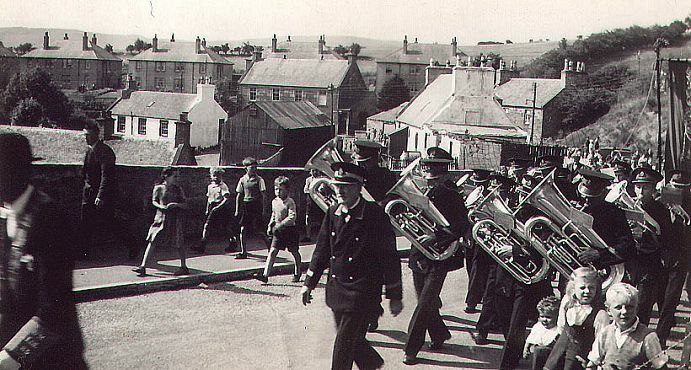 Burgh Silver Band just after WW2 at the Weaver Vennel. 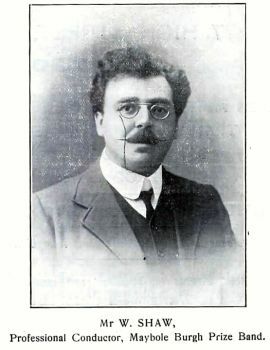 Band leader Robert Hempkin. Comments from Dr Andrew McCormick. 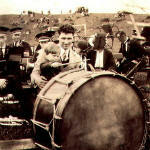 I was actually a member of the Maybole Town Band c. 1948/1949 'til c 1951. I can assure you that Tommy McQuater was not a member then, though I occasionally tell the little white lie that I played in the same band as the great man- omitting to say that it wasn't contemporaneously! 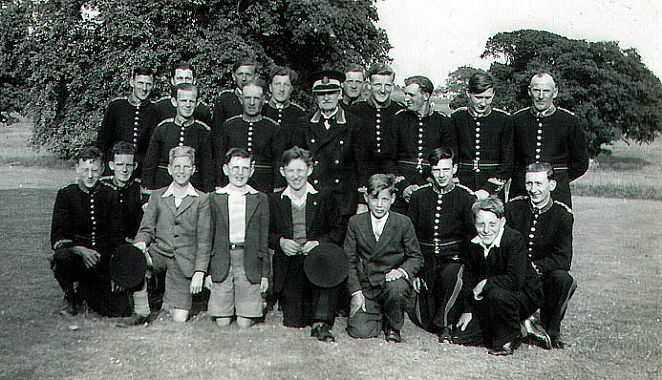 I of course knew most of those present in the photo of the band of 1948 and was in fact a schoolmate of a number of the younger ones- Stan Boden, Jimmy Harris, Ken Murray, Andrew Gardner,etc..Can't think why I'm not in that photo - perhaps taken just before I joined, or am I the question mark( can't make out figures well enough to tell) ?. I have been searching my ancient failing memory for the name of the conductor/composer who took over from Jimmy Colquhoun just about that time - his first name was Sam and he came , I think, from round Patna way. If I remember correctly under his leadership we entered the Scottish Championships and won our section - perhaps the last competition before the band's demise. Another little point - at that time we played a regular Sunday summer concert at Culzean Castle, ie, during Eishenhower's tenancy but not, I think , when he was actually there.